Duelz Casino is a new casino that opened in 2018. It offers a completely different look into the gaming world with the main focus on gamification. The casino invites players to be a part of their own adventure where they can create characters and collect objects, similar to many of the role-playing games that are so popular, both on and offline. And to make things even better, this casino has been designed with mobiles in mind. As we mentioned, this casino is all about gamification, and on arriving at the casino, you'll see what we mean. The characters that guide players around are all reminiscent of a fairy tale with a wizard and an enchantress being the main players. Part of the fun here is the head-to-head duels which see players being given a chance to unlock treasure chests, spells and move up a leaderboard to gain better prizes. The site itself is easily navigable and highly secure. The casino is licensed with the Malta Gaming Authority who have strict rules and requirements as to what a casino can and cannot do in order to ensure the safety of the players and the money they deposit. Unfortunately, not all countries can access this site, and there is quite a long list of those ineligible to join, so check this out before trying to make an account. 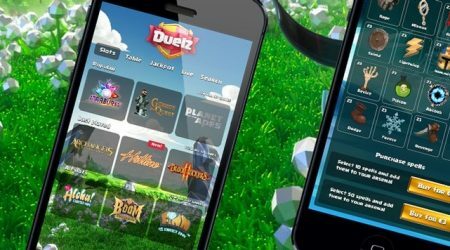 Duelz casino may be different in its setup, interface and the reason behind it, but in some of the main features found on an online casino, it remains the same. 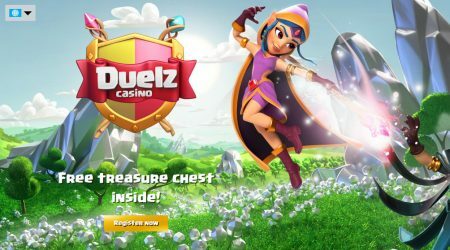 Duelz casino also offers a welcome bonus to bring in new players and to try and keep them playing at Duelz for as long as possible. Unlike the usual welcome bonus that comes in the form of a match deposit bonus, new players have to choose between one of three treasure chests during the signup process. The value of the welcome bonus will depend on which chest is picked (lowest is Bronze, highest is Legendary). Each chest holds a combination of various spells, which players can then use to fight within duels. In addition to this, players will also get to unlock more of these chests as they travel through the casino site. All online casinos have wagering requirements in place as this prevents fraudulent activities such as money laundering, or players simply abusing the system – signing up and running off with the bonus money without ever playing. However, since the setup of the bonuses is not entirely normal – the player does not get bonus spins or bonus cash – there does not appear to be any wagering requirements in place, or indeed needed. Players will have to put their own money in to play and use the spells from the chest. There are no additional bonuses per se, but the duelling, use of spells and treasure chest, reap their own rewards. The spells that are available give various strengths such as dodging, fury, revenge and more. Additional spells can be purchased for real money from the casino shop as these will increase chances of winning a duel. The duels are what make Duelz so intriguing. 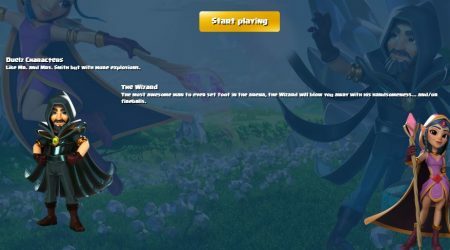 The wizard and enchantress will go up against each other in slot duels. During these duels, each player can use up to 30 spells, and the more duels a player wins, the higher they move up the leader board. Getting to the top will reveal a number of great prizes. Aside from the duelling, Duelz does actually offer regular casino games and a whole lot of them. The site uses the software from popular providers such as Microgaming, Yggdrasil, Evolution Gaming, Quickspin, and Play’N GO. The slots are the biggest collection and offer a number of the most popular games such as Immortal Romance, Street Magic, Romanov Riches, Lucha Legends and many more. The collection is always being updated, so it’s worth sticking around to see what new slots will be added to the site. Table game lovers will also be happy as there is an inordinate number to choose from. Roulette, blackjack, baccarat, the casino has them all. In addition, they are all available in a number of different options and betting limits so that players can choose the one that totally suits them. Progressive jackpots are also a big thing thanks to the use of Microgaming software with their top game Mega Moolah available, as well as other popular jackpots like Hall of Gods and Leprechaun Goes to Hell. The last section of the casino is the live dealer section. Here players can find a whole host of live games all provided by Evolution Gaming. The usual options of blackjack, roulette and baccarat are available. Each comes with different table limits and dealers. There are also a couple of more unusual options such as Dream Catcher, Lightning roulette and the nice variety of card and poker games such as Caribbean Stud, Texas Hold’em and Three Card poker. All of this combined makes this an exceptional site. Duelz offers players a good range of payment options to use including various card and e-wallet options such as Neteller, Paysafecard, Skrill, and ecopayz. All these options are available for both deposit and withdrawal, though deposits will occur instantly and withdrawals can take a bit of time. Players should also bear in mind that different countries will be offered different payment options so check them out first. Despite withdrawal times taking longer than deposits, these are still incredibly fast. In fact, offering withdrawal times of just six hours, these are some of the fastest withdrawal times out there. These payments are done around the clock which is why it can approve these transactions so fast, making the whole process that much better and giving a greater experience to the players. Similar to the transactions, customer support is also 24/7. If there are any issues, the support can be contacted instantly with usually immediate results. Staff are friendly and knowledgeable and can deal with the various time differences that inevitably occur when dealing with players from around the world. There is also a question section that players can consult before trying to contact a staff member. Despite being available around the world, Duelz casino is only available in English. This also means that the support is only available in English. This is generally fine as most people will speak the language when accessing the site anyway, plus the customer support staff will take the time to ensure that players are happy and well taken care of in all situations. Duelz casino is a refreshing change to the usual casino options out there. This duelling, bright, cartoon-crossed game feel, might not be for everyone, but for those that find it appealing, this site is a must-try. It is not just about the unique gaming aspect though as the site ticks all the boxes on standard online casino features as well. There is a full range of games offered by top-notch suppliers and secure payment options. The bonuses might be lacking for some, but the duel aspect of the game makes up for it with the allure of further prizes. Excellent customer service, great security and super fast withdrawal times, put this casino up there with the best on these features alone. Designed with mobiles in mind, the site is perfect for those wanting to play whilst on the commute to work. Have a look, and who knows, the fantasy world may be for you!